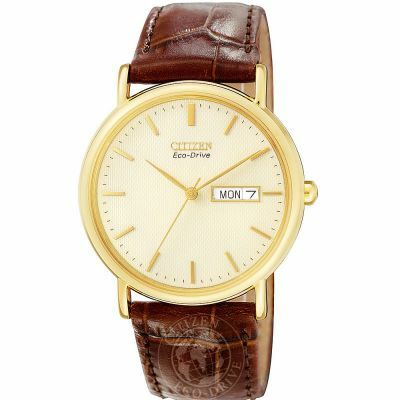 This mens Citizen watch is a fantastic value Eco-Drive watch. 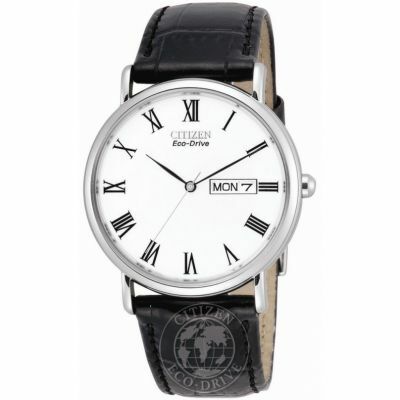 A true classic look with a beautiful PVD case and simple face with stylish Roman numerals. The Eco-Drive feature means your watch is powered by light, so the battery never needs to be changed. Looks and feels quality.Bargain at the price I paid at Watchshop. Seems to keep time ok but only had it for a week! One minor grouse:the control knob is smooth so difficult to adjust time/date. An eighteenth birthday present from my parents. The watch has been much admired by my friends for its stylish retro look with roman numerals, day date, gold bezel and leather strap. A really smart piece. Thank you Mum and Dad and thank you Watch Sop for such a fantastic present! Great service and product. Brilliant communication and quick,prompt delivery. Classic style of watch bought as a Christmas gift for my husband. Watch looks beautiful and very well made. The eco-drive is a fantastic feature and one I know he loves from other watches he owns. 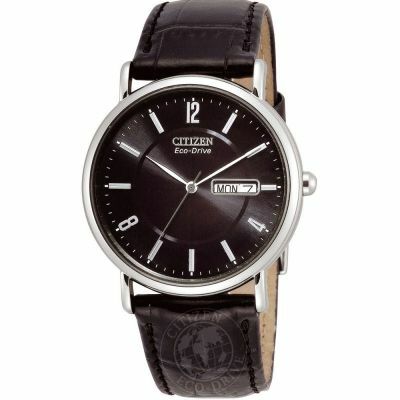 Citizen is a great quality brand in our experience. about 0.5 - 1 minute lag a day. It is a very good watch for the price. So pleased with my Citizen Eco drive, the white face is complemented by the gold coloured case and it sits really well on my wrist. The watch was bought for my 60th Birthday, what a beautiful gift to receive. lovely watch, great service, quick delivery, many thanks. I bought this as a work watch having bought a Mondaine Swiss railway clock watch. The main reason was that it has an eco movement which is basically solar powered. The other benefits were a clear clean face, and also the 5 year guarantee extendable to 6 if you register, which shows some confidence in the item. I have only had it for a few weeks but it keeps time to the second. I guess one has to remember that if you wear it under your sleeve however much sun you have it wont be charging. I tend to leave it somewhere light when I am not wearing it! It remains to be seen if it ever runs down but I am pretty sure it wont let me down. Very pleased with it. I like the idea that I will never need to have it opened to have a battery put in. 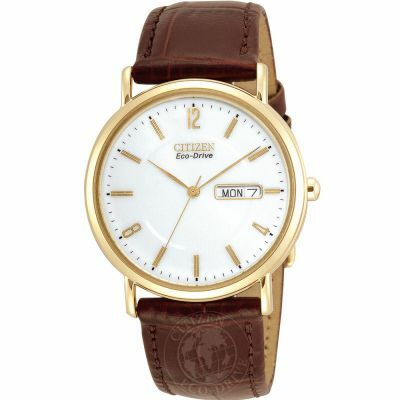 Citizen Eco- Drive BM8242-16A. I rarely buy a watch and spent ages choosing a new one. What appealed was the fact that it looks a bit different and has a useful day/date feature. The numerals give it a classy feel without it looking too dressy for day to day wear. The clarity of the face makes it practical for at-a-glance daily use which is great - but without doubt it has a very stylish look too. There are not that many watches available at a moderate price which display the day and date, so I was delighted to find this model available. All in all I have a practical watch that can be used equally well in a formal setting and its Eco-Friendly too no battery. very reliable timekeeper.would reccomend ecodrive to anybody,my previous watch was also ecodrive .this watch is ahead of its time! The watch looks good in hand, I bought for my father. Its ecodrive property with no replacement of battery looks good for my father. However, the is problem in keys which control time and date change settings. These keys arent working proprly. So my father is not happy with product. I love this watch. I prefer a mans watch for every day wear & this one is very stylish. The Instructions are easy to follow. The strap needs 2 more holes put in it as I have a small wrist. I am hoping Goldsmiths will do this as mentioned on line. Simple, elegant, watch, not big and clunky like so many others. So far it has kept perfect time. I can see why a few reviewers have complained about the strap - I have some of the thinnest wrists around, and I only have two more holes to go on the strap. Goodness knows who might use the previous 4 holes - a skeleton? Anyway, the strap is OK for me, and as a whole, the watch is excellent. This was purchased as a late Christmas gift for my partner. It is a beautiful watch and he is so pleased with it. It looks much more expensive that it actually is. It has a clear, elegant face and a strong strap. It looks masculine without being clumsy. Great as it is a solar watch so does not require batteries. Also had a free extra 1yr warranty so is guaranteed for 6 years which show the confidence that Citizen has in their product.The date feature is very clear and easy to read. All in all this is a very successful puchase as it is not always easy buying for a discerning partner. Well done. Very good looking simple and straightforward watch. Simple to operate and keeps very good time. Ordered this watch 03-02-14. While the watch itself looks very nice with the gold plating and black leather wrist strap , I found that it did not fit around my wrist even though stated as a mans size. Returned for a refund, very disappointed. the watch is very stylish and the watch face is just the size i required as a lot of new watches are to big.the watch strap was very good although i could have done with a bigger strap as it only just fits on last hole.altogether i am extremely satisfied with my purchace. Order arrived with 48 hrs which is excellent service. Watch is a Christmas present for my partner which I hope he likes. A clean and simple watch face, with easy to read numerals. Very stylish and good value for money. Big benefit in never needing to buy replacement batteries. As a woman I got fed up with 'Ladies Watches' that don't tell the date and the day. I love the crystal clear glass on this so I can see the date and day instantly. 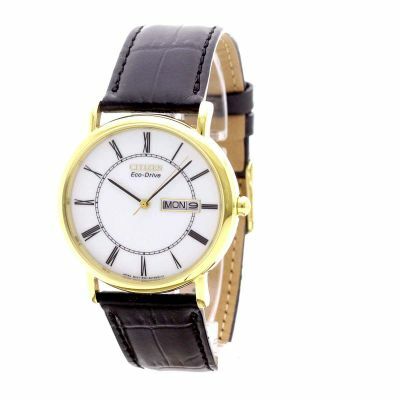 The leather strap is good quality and the gold-coloured casing too. So it doesn't look like a clunky 'man watch' but something a little more sophisticated. So far it's kept perfect time. I'm delighted. good product if you are looking for a simple watch with clear easy to read dial that needs no battery. good value for money with 5yr warranty.